Can I Put Recyclables Inside Of Each Other In My Cart? Newspapers, tea bag wrappers, cracker boxes, and office paper….can you put it all into a cereal box before you put it into your recycling cart? Absolutely. However, if you add an aluminum can or a water bottle into that mix, the answer will change. 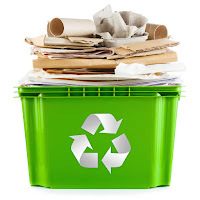 Although Single Stream recycling means that you are welcome to put all of your clean unsorted, unbagged recycling into the same container loose, stacking them or putting some inside of others is subject to some specific guidelines.